Welcome back to another week and a new year of Fantasy basketball. It seems like we’re in for an interesting month as some players came back in shape, while others still have to run of that Christmas ham. This week in the NBA, there were trade rumours galore as the deadline begins to creep closer; Jimmy Butler is back to his old ways in Philly as he challenged Coach Brett Brown about his role with the team; and the Denver Nuggets maintained the top spot in the West thanks to a four-game win streak. 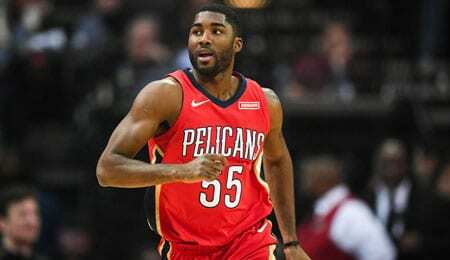 E’Twaun Moore, SF/SG, New Orleans Pelicans (ESPN: 1.1 per cent; CBS: 39 per cent): Prior to Saturday, Moore had scored an impressive 21 (see video below), 17 and 16 points in his last three games, averaging 18 in over 35 minutes per game. He’s a pure scorer who can shoot the lights out and is becoming hard to ignore. Nevertheless, he does not contribute in many categories aside from points and threes. Moore is fighting for a starting position and if he secures it these numbers should be come dependable making him a favourable pick in most leagues. Just note that he left early Saturday with some kind of lower body injury, so be sure to check his status before making a claim. Norman Powell, SG/SF, Toronto Raptors (ESPN: 0.1 per cent; CBS: 1 per cent): Back-to-back 14-point games with a couple of threes, some steals and even some blocks have put Stormin’ Norman back on the Fantasy radar. Kyle Lowry‘s ongoing back issue has played a part in Powell’s increased minutes and role, although, Powell’s style of play is such that his numbers could be sustainable even when Lowry makes his inevitable return. As a result, Powell could be a smart pickup in deeper leagues. Derrick Jones Jr., SF, Miami Heat (ESPN: 0.4 per cent; CBS: 11 per cent): Jones nearly pulled off a double double in 25 minutes last Sunday with 16 points to go along with his nine rebounds. For the season, he’s averaging close to a block and a steal, and has knocked down four threes in his last two games. There’s enormous potential upside to DJJ as one of the more athletic guys on the Miami roster. Ed Davis, PF/C, Brooklyn Nets (ESPN: 0.3 per cent; CBS: 8 per cent): The former Tar Heel hauled down 12 rebounds on Wednesday and nine more on Friday. Unfortunately he only managed to string together six points in each of these games. Davis is an interesting Fantasy option; if it wasn’t for his abysmal free-throw shooting (52.5 per cent) and lack of scoring (that also highly correlates to his FT percentage), he would have found a starting position long ago. He’s a proven shot blocker and one hell of a rebounder, and puts up big numbers in these categories for the minimal minutes he plays. There aren’t many rebounders/shot-blockers of Davis’ calibre on the wire, so if you can afford the hit in FT percentage and scoring in a category league, he can be a steal. Denver centre Nikola Jokic has taken his offensive game to a new level recently. He scored a season-high 39 on Saturday, and in bigger minutes lately (35 MPG over the last five), he’s putting up 25.6 points, 11 boards, nine assists, 1.6 treys, 1.6 steals and 1.2 blocks per game. Fantasy stud city! It’s high time to give some Fantasy love to San Antonio PG Derrick White, who has reached double figures in points in five straight games with some phenomenal shooting (72.7 per cent from the field and 63.6 per cent from beyond the arc). He’s even putting up some serviceable rebounding numbers lately, and his touches are way up this season. Charlotte SG Malik Monk isn’t necessarily having the breakout season we thought he’d have, but when the minutes are there, he can deliver. On Monday, he scored 21 points in 24 minutes and on Saturday, poured in 16 in 22. Monk’s touches are actually down lately, but he’s been jacking up more treys this season. Memphis is falling out of the playoff picture in the West, but don’t blame PG Mike Conley. He put up 31 points in 38 minutes Friday and followed that up on Saturday with 21 in 25 minutes. Conley’s touches are actually down a smidge lately, but he’s bounced back after a career-worst performance from beyond the arc last season. Let us know your favourite Fantasy basketball picks of the week in the comments below. Bjelica had a hot start to the season, cooled off a little bit, and now seems to be back on track. On Friday, he dropped 18 points and six boards in 28 minutes of action. Bjelica has also improved his shot blocking and rebounding of late, averaging 1.7 blocks and nearly seven rebounds over the last week. He’s been inconsistent and has had some truly terrible games, but it’s looking like he may have finally found his rhythm, so don’t miss your chance. The Wire Troll: Is Reggie Bullock the Best Shooter in the League? December 23, 2018 | by Brett Hamlyn | Comments Comments Off on The Wire Troll: Is Reggie Bullock the Best Shooter in the League? Harris has been consistently stringing together efficient games nearly all season. He’s been a real great source of treys lately, knocking down three shots from beyond the arc in each of his last five games. Harris is a shooter who can touch on all categories. This isn’t a breakout player; he’s a full time position holder for you owners that have the spot available. Posted in BASKETBALL, Brett Hamlyn, The Wire Troll | Comments Off on The Wire Troll: Is Reggie Bullock the Best Shooter in the League? The 2015 NCAA Champion has been scoring, rebounding, dropping dimes and – over the last week – averaging a block a game. On both Friday and Saturday, Winslow put up monster lines, flirting with triple doubles in each. He has potential to get double-doubles, but don’t count on them being a regular occurrence. Despite coming off the bench most of the time, Winslow is trusted with solid minutes (28.4 per game) and is likely to produce decent numbers on a consistent basis. Over his last four games, Plumlee has two double-doubles, eight blocks (including four in one game), five steals and 39 points — not bad overall totals, although he did have a damn dud of a game against the Blazers on Friday with three points. Plumlee’s biggest downfall is his free throw shooting (46 per cent), but he can be a solid backup centre in deeper category leagues. He’s a constant double-double threat and a consistent shot-blocker; both categories that can be tough to fill, so his contributions can be huge if applied in the right format.